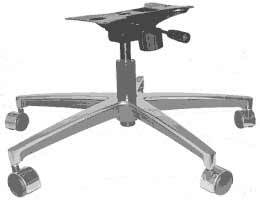 A quality composite 25" or 27" base complete with 2" carpet castors, #10765 gas cylinder and mechanism with 6"W x 10 1/4"L mounting holes. Everything Heavy duty for big people. Read more! See more! Mount to the bottom of your chair and you're good to go! Well built Mechanism mounts at 5 1/2" wide x 6 1/4" front to back. All metal 26" Black base. Shipped with 2" hooded carpet casters and #10765 gas cylinder. Solid Wood 28" diameter. Medium Oak or Cherry Mahogany color caps, or Uninished. 1/4" thick steel underbase. Includes cylinder, 4 section cover, Mech mounts at 5 3/4" x 8 5/8". Mechanism and Base made in US. 27" diameter solid wood with steel 400 lb underbase. Modern contemporary design. Heavy duty Mechanism. Everything Heavy duty for big people. Full 27" diameter no gloss Textured swivel all metal chair base. A tried and true favorite since 1990 with never a breakage complaint. Gas cylinder, 2" carpet casters and mechanism are included. Mechanism plate measures 6 7/8" W and 11 1/4 L. Mechanism and Base made in US. Identical base as on left excepting that the center column is painted black and has a different mechanism. Mechanism mountings are at 6"w 10 1/4" front to back. 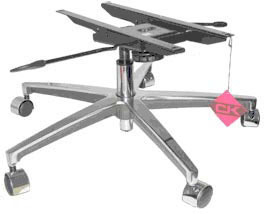 Gas cylinder and chrome 2" casters is included. 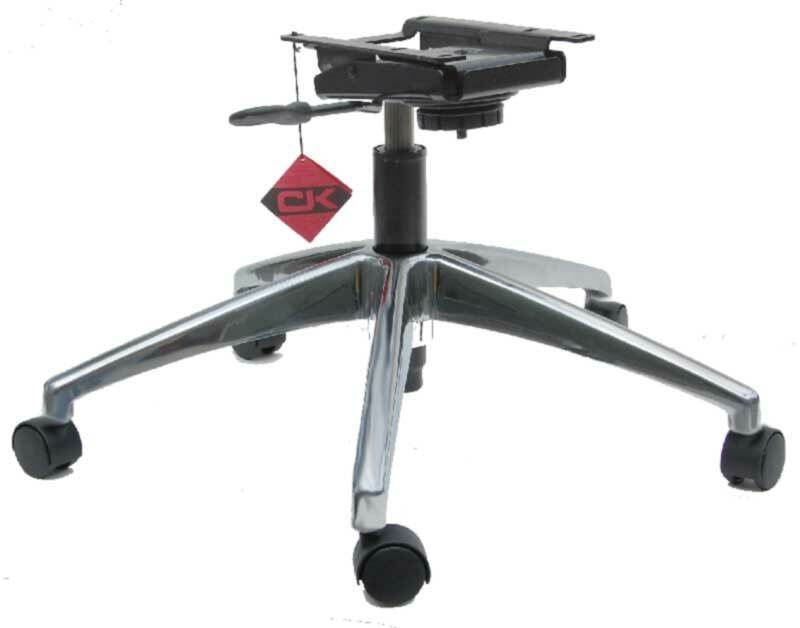 Large 28" chair base with an 18" long mechanism creates an unsurpassed beauty and function to any executive sized chair. Notice the hooded chrome caster wheels and complementing matching chrome center column. Kit includes gas cylinder. A classic full size 28" which meets and exceeds rigorous BIFMA/ANSI industry testing. Complete as shown including casters.Nothing else to purchase. Impressive styling is superb whether behind a desk or in a conference room. Brightly polished base, chrome cylinder and chrome casters. 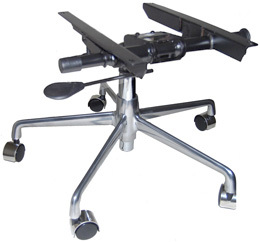 DeLuxe swivel & tilt mechanism with a tilt lockout. Base diameter is a 26". Brushed satin finish 28" metal chair base fit's up to large executive swivel chairs. Includes 2" Barrel type hooded carpet casters and gas cylinder #10765 and a USA 6" x 10 1/4" control. For all normal height seating.